HANDLE A JELLYFISH STING – Contrary to popular belief, it’s not a good idea to urinate on the affected area. Especially if there are children and families present and the person who’s been stung is a complete stranger. Instead of windmilling the old chap ready for action, get some regular household white vinegar, put it onto a paper towel and apply for 30 minutes to the sting. If you’re going to the beach then it’s good to store some in your car. This deactivates the nematocysts (stingers). Don’t pour fresh water on as it can activate them again. Once deactivated, gently scrape away the nematocysts with a shell and go to a chemist for some hydrocortisone. Like bee stings, some people have allergic reactions, so watch for hives or difficulty breathing – the emergency room is necessary in this case. THROW A FRISBEE – Much like skateboarding, roundhouse kicks and breakdancing, throwing a Frisbee is one of those things that looks really easy, until you’re in the presence of a woman you want to impress. Only then, when it’s too late, do you realise that Tony Hawk, Chuck Norris and the cast of Electric Boogaloo are not just “talent-free chancers”. 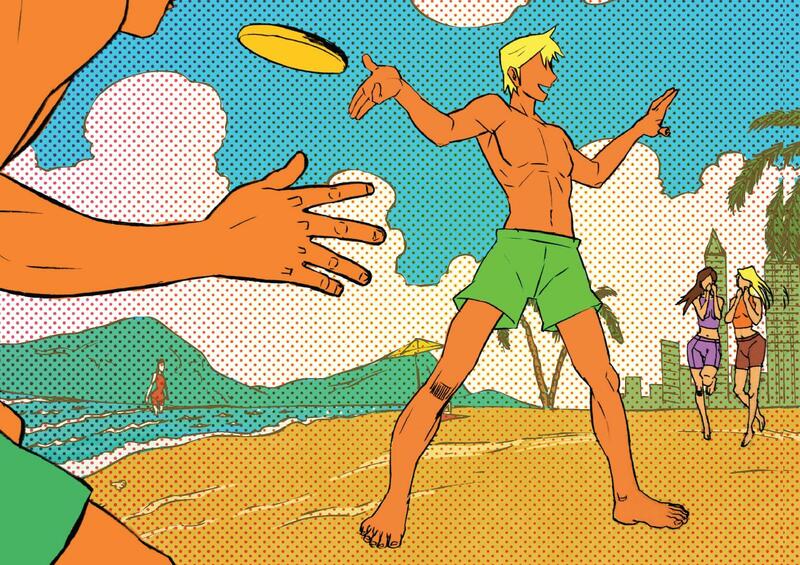 They key to throwing a Frisbee is to think of your arm as two separate parts — above and below the wrist. As the swing of your arm reaches the direction you want the Frisbee to go, flick your wrist as you release. Remember to hold it lightly and keep it smooth, as going for power and ‘giving it some violence’ often causes it to wobble and ditch straight into the sand. WEAR SHORTS – Sounds easy right? Find shorts, buy shorts, wear shorts. Not so, in fact, even that confuses some people, as we saw one man wearing a T-shirt like a nappy in lieu of shorts. He was asked to leave the beach. The basic rules are: wearing long surf boardies if you’re short makes you look like a dwarf. Likewise, a tall man in short shorts looks like a cartoon giraffe on his holidays. If you’re considering Speedos then you won’t be alone as the beaches of the UAE are surprisingly full of gentlemen sporting budgie smugglers. But before aligning yourself with these guys please bear in mind that the look is only one step from a mankini. Those tight ones like Daniel Craig was made to wear in Casino Royale are not as cool as you think. If you don’t have a body like 007 you’ll look vastly inferior in the eyes of every woman and if you do, people will think ‘look at that preening idiot who thinks he’s Daniel Craig.’ You can’t win. He’s killed off those shorts as ruthlessly as he kills inept henchmen. Keep to simple thigh-length shorts in colours you’d be prepared to wear as a shirt. BUILD A SANDCASTLE – You can only really do this if you have children. If you’re an adult building a sandcastle on your own, you’ll look a bit weird, but with children you have cheap labour who you can bully into building things how you want them. And if Dubai has taught us anything about construction, it’s that size is everything, prior experience isn’t important and it certainly doesn’t have to be rainproof. Find a flat part of the beach where the sand is slightly damp and then pile up a load of sand, flattening the top so it looks like the mountain from Close Encounters Of The Third Kind. Then tightly pack sand into a bucket and add turrets to the top, surrounding area and — if you dig it out a bit — on the sides. Fill in the gaps inbetween and then keep growing it until it’s so big it starts to resemble The Burj Tower and gives Nakheel ideas for a new beachside development. A moat is optional, but we are hearing that all the chic sandcastles in Europe now have one, and it does add value. GET A TAN WITHOUT BURNING – There’s a fine line between looking healthy and getting skin cancer. Wearing sun protection over SPF8 and less than SPF15 and then limiting your exposure to bursts of 15-20 minutes is the happy medium. Keep your skin hydrated throughout with a fine mist spray and try to avoid being out in the sun between the hours of 11am and 3pm without SPF30 on the face. GAWK AND NOT GET A SLAP – Why does Bono wears those wraparound shades? It’s not because he thinks they look cool (at least we hope not), it’s so nobody can see where he’s looking. Whether it’s at the brunette in the fourth row or at hiding his money in tax-friendly Holland while preaching about fiscal obligations, the shades help mask his true vision. With shades on you’re free to survey your sandy domain. In addition, paint a thin stick white and take it with you. Then, if any large overprotective husbands start shouting the odds, you can gently wave it exclaiming, ‘Who’s there? Why are you bullying a blind man?’ until he slinks off in shame, leaving you free to carry on gawping.